LEARNABOUTWINE.com Presents The Big “BU”—MALIBU—AT THE VICEROY SANTA MONICA MAY 21st and you can win 2 FREE TICKETS to the event! Each of the following can be done once, giving you two chances to win these tickets! “Like” our FB page and leave us a comment there telling us you’d love to go to the tasting! Then come back here and leave a blog comment letting us know you did! Follow @booze_news on Twitter, then tweet this post and come back and leave us a link to your tweet! If you don’t have Facebook or Twitter, or if you’ve already LIKE(d) & FOLLOW(d), just leave us a comment telling us so and why you’d love to win! That makes this giveaway worth $98-$160! Giveaway closes Wednesday, May 18th at 12:00am CST. Winner of two tickets will be chosen via random number generator. Once contacted, the winner has 24 hours to reply to email. After this time, if we haven’t heard from you, another winner will be chosen and contacted. I would love to win because I enjoy wine tasting, the culture and any charity. But especially one the works directly in my community. I totally liked you on facebook and retweeted the contest on twitter. In fact it was my very first Tweet ever! That’s how much I want to go wine tasting. I don’t have as many friends as Joy, so I’d like to go wine tasting to meet more friends, taste good wine, and discover the new, up and coming tastes of Malibu! What a great way to begin your life on twitter! Good luck to you…& to everyone who enters! I’m your biggest facebook fan! Crossing my fingers and hoping to win the tickets! My girlfriend and I have never gone to an actual wine tasting event, and hopefully this will be our first, that’s if we win. And I did leave my comment and “Liked” your page. 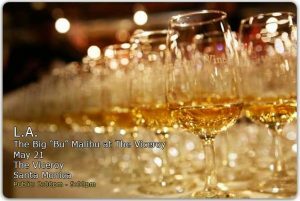 Want to win as we are relatively new to Malibu and have tasted some wines from the ‘bu but would love to see (and taste) them all in one place!! I did retweet on twitter, but then saw this and thought I’d post here, too! This would be a terrific way to entertain a Montreal friend who is in town for a visit. 1) I LOVE that this event is donating its proceeds to Meals on Wheels West. I had the pleasure of working with the organization in Santa Monica in 2010. When volunteering with Meals on Wheels West, I quickly recognized that the recipients of the meals needed the conversation and friendship of the volunteers almost as much as they needed the food that was being delivered to them. They also helped me just as much I helped them. I cherish the friendships I made during my time with MOW. 2) I spent countless summer days on the beaches of Malibu. I am happy to learn that Malibu not only hosts amazing scenery, but also wineries. Who knew?